Back to Bill Caid's Home Page. Lance 1685 Travel Trailer in Tucson, AZ. Soon to be mounted on Thor (our 1017A 4x4). Both Kathleen and I had been whining about various failures on the HiLo trailer that we mounted on Thor (our Mercedes 1017A 4x4 truck) back in 2010. That build-out is documented on my site. And as can be seen from our various trips since 2010, we have gotten good use from our efforts. That said, the HiLo design was less than fully robust and we had a number of failures over the years including shelves coming loose from the roof and other mechanical failures. These failures were getting worse over time and it was clear that sometime in the near future, likely in an inopportune time, a major failure was happen. 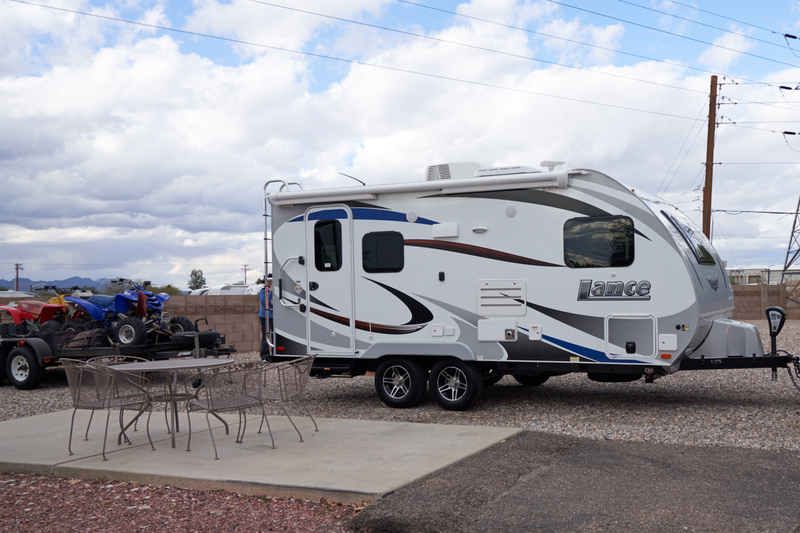 We had been discussing a replacement strategy for over a year when a conjunction of events caused us to be in Tucson where we spotted a new Lance 1685 trailer for sale at an RV dealership. The trailer was last year's model, but unused. The dealer had deeply discounted the unit so things were in alignment for a replacement. We inked the deal and returned a week later to pull the Lance home to San Diego. Along the way, we had a large issue to address as my BMW M5 sedan was stolen from my driveway by my next-door neighbor's "friends". We know what happened as we saw it on video. The sections below detail the build-out actions necessary to get the Lance ready for mounting on Thor; the removal of the HiLo from Thor and the mounting of the new living quarters on Thor. The link table below contains links to the photos and dialog for each of the days of the effort. This table will be updated as the effort progresses. A variety of cameras were used to document this effort including a Sony A7RM3 and a Fuji XH-1. Conclusions and Advice to Prospective "Build-Outs"
This is a large undertaking requiring a broad range of skills. I would not suggest attempting this sort of effort unless you had a range of skills at your disposal, either personally or via personal/professional relationships. Photos and Text Copyright Bill Caid 2019, all rights reserved.